A deeper understanding of teens’ writing habits—both inside and outside of the school environment—is crucial for developing successful programs to improve writing skills and achievement. Today’s teens engage in significant amounts of writing, particularly in scholastic settings. All teens say they write for school (half doing so just about every day), and most do at least some writing outside of school. A majority of teens get some enjoyment from the writing that they do for school, although they get more enjoyment from the writing that they do for themselves outside of school. Yet in spite of recommendations from educators and researchers that students should write at length, do projects requiring research and analysis, and write across the curriculum in a variety of content areas, many teens report that they write mostly short pieces that are not research-based, and receive longer assignments primarily in English and language arts classes. Virtually all teens write, although scholastic writing is more common than writing done outside of school. In order to evaluate the prevalence and types of writing in which teens engage, we asked our survey participants whether they had done any of ten school writing activities (and eight non-school writing activities) over the past year. Their answers indicate that writing, whether done for school or for personal enjoyment outside of school, is deeply integrated into their lives. All but two of the teens in our sample engaged in some form of school writing in the past year. Nearly as many (93%) say they write for personal reasons or just for fun outside of school. 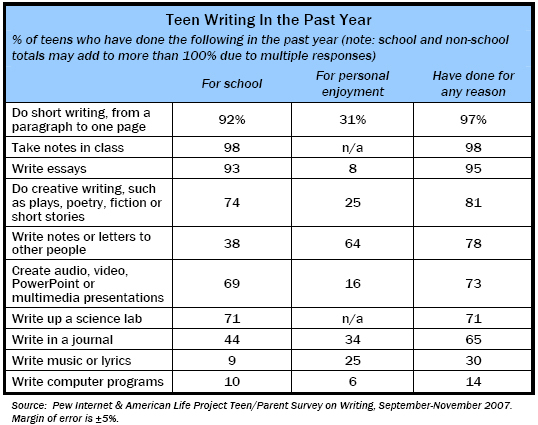 Of the ten types of writing we evaluated (see table below), the average teen has engaged in seven over the course of the past year for any reason. Teens tend to engage in a greater range of writing activities for school than for personal reasons—our respondents engaged in six types of school writing (out of a possible ten) on average in the past year, versus an average of two types of non-school writing (out of a possible eight). The writing activities we evaluated fall roughly into three groups based on their popularity. The first group includes the most popular or common writing activities, and includes short writing, taking notes in class and writing essays. This writing is typically performed in school or as part of a school assignment, although nearly one-third of teens (31%) write short pieces of one page or less in length for their own personal enjoyment outside of school. The second group of writing activities includes those that are slightly less common. Creative writing, notes or letters to other people, presentations, science lab write-ups and writing in a journal are all part of this “common but not universal” category. 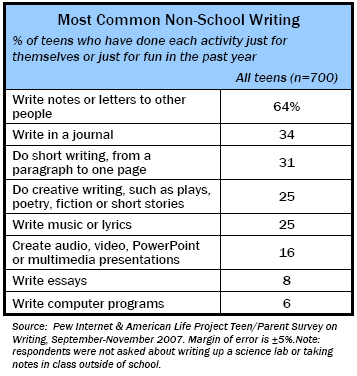 Writing music or lyrics and writing computer programs are the least common writing activities among teens. Nearly one in three teens wrote music or lyrics in the past year (most of them for personal enjoyment) and 14% wrote a computer program. These activities’ relative lack of popularity may be due to the fact that each requires specialized knowledge of a “language” other than written English and therefore has a higher barrier to entry than the other activities in our study. Teens engage in a range of writing activities at school. As noted in the introduction to this chapter, writing for school is a near-universal activity among teens. The most common types of school writing (and indeed the most common types of writing teens do for any reason) are taking notes in class, writing essays and writing short pieces of a page or less in length. More than nine in ten teens have done each of these activities for school in the past year. Writing computer programs and writing music or lyrics are the least common types of school writing—just one in ten teens did either of these activities for school in the past year. Socio-economic status, age and race/ethnicity are only slightly correlated with the types of writing teens do for school. Ensuring gender, racial and socio-economic equity in writing instruction and achievement is a primary concern of educators and policy makers. While most teens do similar types of writing in school, we found some differences in school-based writing centering on race, gender, age and socio-economic factors. As teens progress in their academic careers, they tend to write more essays and create more presentations for school (whether audio, video, PowerPoint or multimedia). Although essay writing is extremely common among teens of all ages, older teens ages 15 to 17 are somewhat more likely to do this type of writing than younger teens ages 12 to 14 (96% of older teens do this, compared with 90% of younger teens). Older teens are also much more likely to create presentations for school (76% of older teens have created presentations for their course work, versus 61% of younger teens). Beyond these two activities, younger and older teens do similar types of school writing. 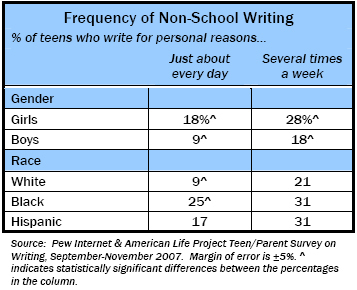 With some exceptions, racial/ethnic differences in teen writing for school are minimal. Black teens are significantly more likely than white teens to maintain or write in a journal as part of their class work and to write music or lyrics for school. Nearly six in ten black teens (57%) write in a journal for school, and 17% write music or lyrics. In contrast, just four in ten whites (41%) write in a journal and fewer than one in ten (6%) write music or lyrics for school. White teens are significantly more likely than English-speaking Hispanic teens (but not blacks) to create presentations for school (72% of whites and 58% of Hispanics do this). Teens from higher- and lower-income families largely do the same types of writing at school, though some small differences do exist. Teens from families earning $50,000 or more per year are more likely than lower-income teens to write up science labs (75% of higher-income teens do this, compared with 67% of lower-income teens) and to create audio, video or PowerPoint presentations (72% vs. 61% for lower-income teens). Finally, some gender differences exist with respect to the types of writing teens do at school, although these differences are generally quite minimal. Specifically, girls are slightly more likely than boys to write essays at school (96% of girls do this, compared with 91% of boys), while boys are slightly more likely to write computer programs (13% of boys and 7% of girls have done so in the past year). Most teens write nearly every day for school, and the average writing assignment is a paragraph to one page in length. Half of all teens (50%) say that their school work involves writing something just about every day, and more than one third (35%) do school writing several times a week. The remaining 15% write for school several times a month (7%) or less frequently (8%). The frequency with which teens write for school exhibits little variation across demographic or socio-economic boundaries. Interestingly, 61% of black teens say their school work requires them to write something just about every day, significantly higher than the rate for whites (47%). However, the percentage of teens who write for school several times a week or more is practically identical for whites (83%), blacks (87%) and Hispanics (87%). We do a lot of essays at my school particularly in English and history classes and we are writing an essay for a major grade probably once a week in one of the classes. So there is a lot of practice. The internet is a primary source of research for school writing assignments. The internet is not just a near-ubiquitous technology in the lives of American teens; it is also their primary method for conducting research for school. Fully 94% of teens use the internet at least occasionally to do research for their school writing assignments. Nearly half (48%) do so once a week or more, while one quarter (26%) do so several times a month. For one in five teens, using the internet to research for their writing assignments is an occasional activity that occurs fewer than several times a month. Teens in our focus groups discussed the ease with which they answered their questions using internet resources. Well I’m on like Google or Google images like at least everyday. I use it for everything . . . . [S]chool or like if somebody is talking about something and you have no idea what’s going on so you’ll go home and you’ll Google it. And you’ll be like oh, that’s what they’re talking about. – 9/11th Grade Girl, Southwestern City. You will find something and be like oh yea I want to learn more about that. Rather than drive down the library and find a book, you can research right away on different programs. It is easier to share information with people. I think it makes it better. – 11/12th Grade Girl, Pacific Northwest City. 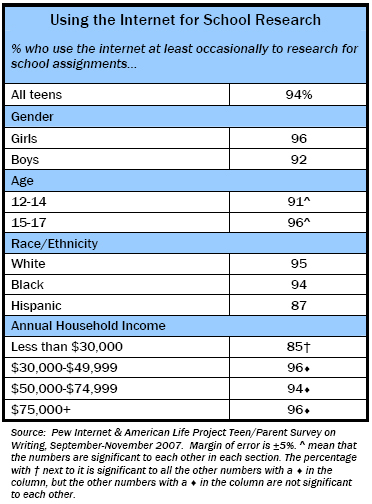 Using the internet to research school writing assignments is most common among older teens and those from higher-income households. Teens use longhand most often for school writing, although computers are common as well. One of the major questions animating this study was whether and how teens use technology in their writing. While most teens have at least limited access to technology, teens generally report that they still primarily do both school and non-school writing longhand. Despite widespread technology ownership and usage among teens, almost two-thirds of teens (65%) say they usually do their school writing by hand, compared with 16% who usually use a computer. The remaining teens say that their choice of writing instrument depends on the assignment (4% of teens say this), or that they rely equally on longhand and computer writing (14%). However, the vast majority of teens do at least some of their writing with the aid of a computer. Among teens who primarily write by hand, 86% write using a computer at least occasionally. Taken together, this means that just 9% of all teens write only by hand and never use a computer. As befits their higher rate of computer ownership, white teens are more likely to rely on computers for their school writing than their black and Hispanic counterparts. One in five white teens (19%) typically do their school writing on a computer, compared with one in ten blacks (11%) and English-speaking Hispanics (9%). Older teens also tend to rely more heavily on computers when writing for school. One in five (21%) 15-17 year olds usually use computers for their school writing, compared with 12% of younger teens. Students whose parents have high levels of education (college degrees and above) are more likely to say they usually use computers for school writing more than parents with lower levels of education. Almost a quarter (24%) of teens whose parents have a college degree say they usually use a computer for school writing, compared with 10% teens with parents who have some college education, 15% of teens whose parents are high school graduates, and 10% of teens whose parents have less than a high school education. Teens in our focus groups pointed to a diverse array of reasons for using one writing method over another, and reflected extensively on the place of handwriting and computer use in their composition and writing processes. Many teens told us that they appreciated the speed and neatness with which they could compose and edit on the computer, while others felt it was easier to organize their thoughts and unleash their creativity when composing by hand. These statements highlight the thoughtfulness with which many teens engage in the writing process, although some participants pointed out that the decision of whether to write by hand or by computer is decided by their teacher and not the students themselves. I like handwriting. I don’t know, I feel more organized writing by hand especially with outlines and drafts and stuff. I find it hard to think creatively when I am typing so I like to handwrite everything then I put it on the computer. I don’t know that is just how I am. – 9/10th Grade Boy, Pacific Northwest City. We’re required to type almost all of our papers. – 9/10th Grade Girl, Midwestern City. I type so much faster than I write. But, if I want to make a paper much better I have to type it out first, then hand write in the changes, then type the good copy. And it makes it easier to think things through if I can handwrite it. And I think my worst work is when I just type it and don’t handwrite it. I usually type because I do have messy handwriting. So I like typing and I find it easier to collect my thoughts. I don’t have to worry about the spelling and I can worry about the creativity of the story rather [than] if I spelled it right. – 7/8th Grade Boy, Midwestern City. Compared with the writing they do for school, teens engage in a narrower range of writing activities in their personal time. In addition to asking about writing for school, our survey also asked teens about the writing they do for personal reasons or just for fun.14 While this type of writing is not as widespread as the writing teens do for school, teens do engage in a wide range of writing outside of a school setting. More than nine in ten teens (93%) say they have written something for themselves or just for fun in the past year. Notes and letters to other people are by far the most common type of non-school writing. Nearly two thirds of teens (64%) have written a note or letter to someone in the past year, making this activity roughly twice as popular as writing in a journal or doing non-school short writing. One-quarter have done some sort of creative writing or written music or lyrics, and a slightly smaller number (16%) have created a presentation for personal reasons. Fewer than one in ten write essays or computer programs during their personal time, making these among the least popular non-school writing activities. Gender and race/ethnicity are somewhat correlated with teens’ non-school writing. As with the writing they do for school, most teens have similar writing habits outside of school regardless of their demographic or socio-economic characteristics. However, some teens are more likely to engage in specific writing activities outside of school than others. For instance, black teens are more likely than whites to write in a journal and to write music or lyrics in their personal time. Nearly half of black teens (47%) have written in a personal journal in the past year, and nearly four in ten (37%) have written music or lyrics. This compares with 31% and 23%, respectively, for white teens. It’s just like a pastime. People . . . write stuff in their journals. [It’s a form of] expression. Like if you have too much stuff on your mind you can just write it out on paper. Among all demographic groups, boys are the least likely to write outside of school. One quarter of teenage boys (26%) say they have done no writing for their own personal use or enjoyment in the past year, a rate that is consistent for both younger and older boys. Yes. I like to express myself through my writing. But I don’t do it too often. If something happens in my life, I write it down – if something big happens. – 11/12th Grade Boy, Northeastern City. I just write when I have to for like school. I do texting but I don’t do like full papers. – 9/10thth Grade Boy, Pacific Northwest City. Compared with school writing, teens write less frequently outside of school. Outside of a relatively small group of intense writers, non-school writing is something teens do infrequently. Among teens who ever write for personal reasons or just for fun, 13% do so just about every day, and an additional one quarter (23%) do so several times a week. Taken together, this means that 36% of teens write consistently and regularly outside of school—less than half of the 85% of teens who write several times a week or more for school. An additional 24% of teens write for personal enjoyment several times a month, and roughly two in five (39%) do so even less often. Minority teens and girls are among the most prolific writers outside of school. Fully 56% of black teens and 48% of English-speaking Hispanics do non-school writing on a regular basis (defined as several times a week or more). In contrast, just 30% of white teens write regularly for their own personal enjoyment. As with school-based writing, black teens are significantly more likely than whites to write outside of school just about every day. Girls are also highly prolific writers outside of the school environment, with nearly half (47%) writing regularly for personal reasons—nearly double the rate for boys. Teens use computers less and longhand more when writing outside of school. Nearly three-quarters of teens (72%) who write for personal reasons say they usually write longhand, similar to the 65% of teens who usually write by hand for school. 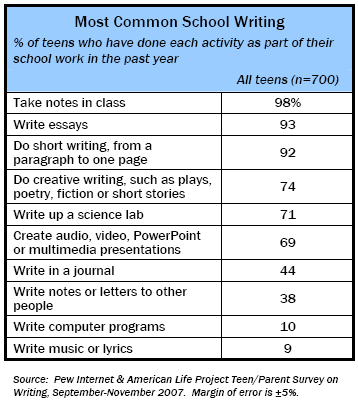 However, teens are much more likely to write only by hand when doing non-school writing. Nearly one third of teens (32%) never use a computer at all when writing for their own personal enjoyment; by contrast, just 9% do their school writing by hand only. Whites and older teens are again the most prolific computer users when it comes to non-school writing. Almost one quarter of white teens (24%) say they usually do their non-school writing on a computer, compared with 5% of black teens and 11% of Hispanics. Similarly, 21% of teens ages 15-17 usually use computers for their non-school writing, compared with 15% of teens ages 12-14. While girls and boys are equally likely to use computers for their school writing, boys show a greater tendency to rely on computers when writing for personal enjoyment outside of school. Nearly one-quarter of boys (23%) primarily use a computer for the writing they do for personal enjoyment, compared with 14% for girls. This difference may be due in part to the types of writing boys and girls engage in. As noted above, girls are more likely than boys to engage in traditionally longhand activities such as writing letters or notes and maintaining a personal journal. Teens whose parents have high levels of education are also more likely to use a computer in their non-school writing than their peers from households with lower levels of parental education. Fully 31% teens from households where their parents have a college or advanced degree usually use a computer for their non-school writing, compared with 14% of teens with parents who have some college education and 13% of teens whose parents have no college experience.